My 15 year old son has been diagnosed of scoliosis with a 60 degree angle. Orthopedic outrightly calls for surgery but I'd like to explore other alternatives. Please point me in the right direction and if you are able to recommend a reputable chiropractor in South Africa I'd appreciate it. Gosh, that's a severe scoliosis, let's be honest. It's a great pity that it's been allowed to progress like that, easy to say with hindsite. My point is though, since this can be a learning curve for others who read this webpage, that a child doesn't develop a severe scoliosis overnight. Vital, first step is to check for a leg length discrepancy. A short leg. That should be addressed immediately. My opinion, not that necessarily that of others is that scoliosis is a specialty, not to be handled by GPs, physios or chiros not experienced in treated scoliosis. Where do you live? Then I can start a hunt for you. Of interest, I saw a lady this week, 83, retired only in December, with a 60 degree scoliosis. She was told by her medic that she'd be in a wheelchair by 45. And she's still walking, managing, and comes monthly for her treatment. She has been under chiropractic care for her whole life. Let me know at Contact where you live. I also have a child diagnosed with scoliosis (35 degrees) and I am also in the big mixed-up world of where to find proper, non-invasive treatment within the Pretoria, Johannesburg (or even South Africa) area. I am also exploring some treatment overseas. I would love to share some information I have gathered so far. Unfortunately there is a gap in the market because Orthopedic surgeons are in the business of surgery (which we are trying to avoid). Orthos will also not often speak highly of the Chiropractors or Physiotherapists doing the treatment, but who else then? There is a gap where us parents run around like headless chickens trying to find anything and everything we can do to firstly prevent any further progression of the curve and secondly to try to reverse the curve and gain back some normality and lesson the pain. There is no one is SA who offers intensive treatment programmes. The wait and see and the rigid Boston brace was prescribed to us by the Orthopedic surgeon...well we waited and it became 5 degrees worse! The hard Boston brace is NOT used anymore across the world because it causes muscle atrophy over the 2 years the poor child must wear it for around 18 hours a day and at no guarantee. The RSC brace, which is also rigid but only worn at night, not only helps put pressure on the C- or S-curves of the spine but also helps to de-rotate the spine because that is actually the main problem with Scoliosis, the spine is not just in a C or S curve but the vertebrae are rotated, hence causing the rib cage problems, etc. This brace also over-corrects the curves to encourage the muscles and ligaments to either stretch or contract depending on which ones need to do what. And yet not one Dr in SA has mentioned the RSC brace (and I have now been to 3 Orthopedic surgeons at great cost). Even the South African Spine Society, which one would expect is a very highly regarded association regarding scoliosis, gives advice of 'brace and wait and see and then operate when the degree gets too high'. And one of the doctors I consulted with my daughter is on their Committee and he prescribed the Boston brace and see him in 6 months. Well that 6 months cost us another 5 degrees progression on her spine - thanks doctor! He didn't even mention the word physio, chiro, etc. so if the SA Spine Society is so backward in thought on scoliosis then we as parents are really left to our own devices. I have managed, through loads and loads of research to find some forms of Chiro and Physio that does work and help these children, you just have to find the correct Chiropractors and Physios that are forward thinking and open-minded together with the correct RSC bracing. I would love to hear from other like-minded parents who are also searching for any and all REAL treatment for our children with scoliosis... we don't have time to sit around and wait, every month that goes by is a risk for further progression. You have attached yours to someone else's post, and I can't promote it. I am Beatrice West of 100 Adams Street, Texas, USA. I want to quickly enjoin all here to help me say a big thanks to Doctor Uwadia Amenifo for his wonderful work he has done for my family for saving my son of his Hypermobility and scoliosis. Brethren, my son by name is called Josh, and he is 18 years old. He was very ill when he was 8 years, and was treated, we noticed that he begin to have issues with working when he was 10 years he always complain of his joints and spine, and we took him to hospital for treatment, and the doctor diagnosed hypermobility, so he was given medications, and we continued to give him his medications until when he was 15 he was also diagnosed of scoliosis in this. My son was unable to bend forward and backward. He was walking with pain, he doesn’t sleep well, would wake up in the middle of night to toilet and during daytime he can't stand to wee and we need to rush him to toilet. This continued for two years and I was running hectare scepter looking for how to get a cure for him. I was always doing a research online about his disease, and I found in a blog where a woman aged 50 testified of how she was cured of scoliosis by a herbal Doctor Uwadia Amenifo with the use of herbal medicine, and she didn’t have to undergo any surgery. So I found the info interesting and decided to be in contact with the said herbal doctor. In the blog were the contact details of the herbal doctor. So I pick up his contact and contacted him. After explaining what my son is going through he simply said to me that he is suffering from scoliosis that was when I then told him that also he had hypermobility. So he counseled me, and promised me that he will cure my son with his herbal medicine. So we concluded the arrangement, and he prepared the herbal medicine, and sent it to me in Texas. So I gave it to my son just as he directed and to god be the glory my son was totally cured by his herbal medicine of his hypermobility, and also of scoliosis, and as I write this testimony, my son is totally cured and can now move well and do all he was made to do. So please I want all here to help me say a big thanks to doctor Uwadia Amenifo for his wonderful work in the life of my son. Today my son is totally cured. I have osterporosis and also some scoliosis in my back, I am looking for a doctor in Norwalk,CT, USA . Appreciate if you could send me some names. I'm afraid I can't help you, Steff. Talk to friends and family, your doctor for the name of a local reputable chiropractor. In necessary phone you state chiropractic association. I have LEARN THERE IS an alternative treatment referred to as Schroth systems. Is there any chiropractor in RSA currently using this system? 'Fraid I know nothing of Schroth systems. You could try contacting Dr Reg Engebrecht, the Secretary General at the Chiropractic Association of SA website. thanks for your assistence. i will Try the recom mended chiropractors. He has exercises from a Physio which he had stopper for sometime and is now back on. I will encoursge him to swin more regularly as suggested i will also take pictutes as suggested to raise awareness to others who night benefit from our experience. A photo taken from behind plus the X-rays would be very useful. You can load them at the first page you wrote, or send them to me at CONTACT and I will load them. This is a very useful contribution for others, thank you for participating, and I hope we can help your son. Both are experienced chiropractors and, if any chiropractor in SA can help your son, then I'm sure they can. However, don't expect any significant lessening of the scoliosis. The aim at this stage is to stabilise the curvature (it can get much worse still) and relief of discomfort and pain, get him onto a disciplined set of exercises. I personally think it's worth six months of treatment, and after that seriously ask if surgery should be considered. I hope this contributes. Please let us know how you get on with Dr Boshoff or Neethling. BTW: Take a digital photogragh of your son's X-rays and please load them at this page. It would be instructive for others. Hi. Thanks for your honesty and willingness to help. I noticed the curverture on his spine begining last year and took him for physio who worked on him and prescribed exercises. Un fourtunately we didnt take Xrays till now which revealed the extent of the problem. Im in South África , johannesburg, Pretoria area. I would like to believe surgery is the very last option. Your am grateful for your assistance. 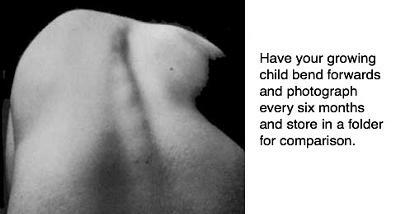 I have made provisional enquiries to see if there is anyone in Gauteng who specialises in scoliosis. I'll let you know what comes of it. I would recommend he start swimming three times a week minimum for a start. The Clear Institute (in St. Cloud, MN) has done ground-breaking work on NON-invasive treatment for scoliosis and huge success in reversing it. Email Dr. Woggon to receive their newsletter and to get help. Yes, I believe this an excellent option, though I know of no such treatment in South Africa. But just reading their site would be instructive.